The following are Bank of America Merrill Lynch's latest forecasts for major currencies. "My view on the EUR remains that it is likely to fall much more, and I think parity to the USD is a feasible target in six months. Inaction by the ECB this week may see EUR continue to hold its ground for now, but I doubt it will bounce much, and there is a significant risk that it continues to trend down, confounding those that are waiting for a squeeze of short speculative positions. 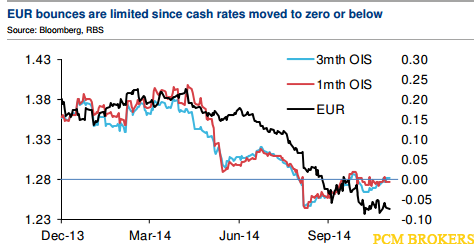 A key shift in the EUR/USD tone occurred when its cash rates moved below zero. They have since returned to just above zero, near the top end of the -20bp to +5bp policy corridor. They are near the top of the corridor because the ECB has not started up its liquidity pump yet. But even the QE policies implemented to date are likely to get the pump working a bit, and when it does, cash rates will slide into negative territory again. ...We expect the EUR fall to intensify as rates become more significantly negative"
The following are UBS' latest short-term (mostly intraday) trading strategies for EUR/USD, USD/JPY, and NZD/USD. EUR/USD: Flows were mixed last week; we will stay flexible intraday. Fade a 30-40 pip move in either direction with stops at 1.2380/1.2500. USD/JPY: gapped up to 119.15 from 118.75 after Moody's downgraded Japan but soon dropped through 118.60 down to 118.35 in poor liquidity. The dollar remains well-supported. Buy on dips. NZD/USD: Stay short, adding towards 0.7860 with stops above 0.7950, targeting the November low of 0.7660. RBS is out with its top FX themes and trades for 2015. The following is a list of these trades along with a brief rationale for a couple of them (selling EUR/USD and selling EUR/JPY). 1. This trend is a credible friend: Short EUR/USD. Rationale: "Monetary policy divergence is the meatiest FX directional theme in years. ECB ramps up QE while the Fed tightens, eventually. Europe must tackle a very large output gap (excess unemployment) and confront deflation risks as PMIs suggest renewed contraction. Monetary easing has much further to run and bank balance sheets still need significant restructuring. Politics gets much noisier as anti EUR parties gain ground in more countries...Policy divergence is far from fully priced," RBS clarifies. 2. Dollar borrowers are breaking down: Long USD versus MYR, SGD, TWD. 3. Long is just so last year. This year, short is in: Short GBP/SEK. 4. Old carry habits die hard: Short EUR/INR. 5. Structural strength beats cyclical softness. Long MXN/COP. 6. Real rates are a real issue. Long USD/TRY. 7. Counter consensus ‘bottom draw’: Short EUR/JPY. Rationale: "Global market liquidity can vanish when most needed on banks’ diminished warehouse capability. So keep one (Rocky) Liquidity Horror Show trade ‘bottom drawer’. That can be long Yen... IF global risk deteriorates rapidly, then the yen could appreciate, stratospherically," RBS argues. EUR/USD: opened flat but the heavy tone is intact. We remain short and ready to add near 1.2330-40 with an intraday stop at 1.2375. There is very little in terms of important data releases this week. Liquidity is likely to dry up into the year-end. USD/JPY: traded to new high of 121.86 likely on speculation of an overwhelming victory of PM Abe's party in the Dec. 14 election. The pair met good profit-taking selling near [IMG]resource://skype_ff_extension-at-jetpack/skype_ff_extension/data/call_skype_logo.png[/IMG]121.90- 122.00. Buy on dips as all factors, including firmer US rates, point to higher spot. Japan asset managers and real money names should still have buying interest at 120.50-120.80. NZD/USD: remains soft after breaking through the November low of 0.7660 to 0.7643. Given the better US payrolls, we don't want to fight the trend and will sell rallies towards 0.7680-0.7700, targeting lower. EUR/USD managed to recover from the lows despite the poor TLTRO and the diverging paths of monetary policies. 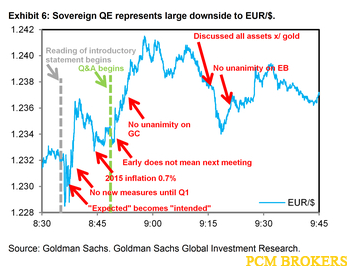 “We study tic-by-tic moves in the Euro during last week’s ECB press conference, which saw EUR/$ spike higher. We think the price action underscores our take that the single currency is not pricing sovereign QE, validating our view of significant downside in EUR/$ in the months ahead. We think this price action is revealing in a couple ways: (i) the initial move lower in EUR/$ on “expectation” becoming “intended” underscores once again – as did the November press conference – that the ECB’s goal of expanding the balance sheet by €1trn is not yet fully priced, leaving aside the question of whether (and when) sovereign QE is coming; and (ii) the market is still distrustful that the ECB may do sovereign QE in short order given the divisions on the Governing Council. We see both things as meaningful, given our conviction that sovereign QE is coming – indeed, as we note above, President Draghi’s use of the term QE was the most ever during last week’s press conference. The following are a selection of some of the key points in ANZ's analysis for the latest speculative positioning report (positioning data is for the week ending 16 Dec). Leveraged funds reduced their overall net long USD positioning by USD2.2bn. This is the third consecutive week that USD positions were reduced, as well as the longest stretch of USD reduction since July 2014. This week’s reduction in USD positioning was driven by the buying of CHF and commodity currencies even as net selling in EUR and JPY was registered. Post the cut-off date, net buying of USD was likely to have been reinstituted given the price action in the DXY after markets obtained greater clarity and affirmation of the commencement of rate hikes in 2015 in the 18 December FOMC meeting. Commodity currencies took a breather this week, registering net buying across the board of USD0.6bn. In particular, AUD saw net buying of USD0.2bn for the first time in 4 weeks. Net short positions in AUD fell by USD0.2bn to USD1.9bn. Net shorts in the EUR increased for the first time in 4 weeks, to USD15.5bn from USD13.1bn previously. 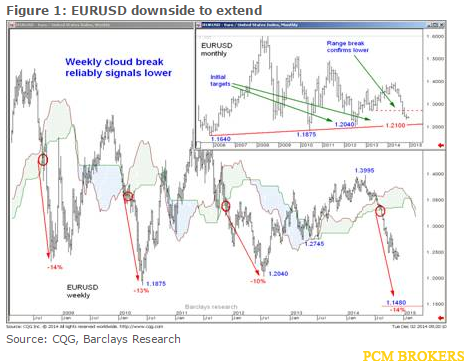 Plenty of macro and technical factors are currently in play for EUR/USD to extend its slide into the coming few weeks and to start early 2015 on a weaker note accordingly, says Barclays Capital. "We think extremely low euro area December inflation (7 January; Barclays and consensus: 0.0% y/y) will support our call for further ECB easing through the announcement of European government bond purchases at its 22 January meeting and provide a catalyst for further EURUSD depreciation during next year). In contrast, last week’s December FOMC statement and press conference confirmed our view that the Fed will begin hiking rates around the middle of next year, providing broad support to the USD in the context of US economic outperformance relative to other major economies," Barclays argues. Moreover, Barclays thinks that politics will also be an increasingly significant factor for EUR/USD over the coming weeks. "The second (23 December) and third (29 December) rounds of the Greek presidential election are likely to be an immediate focus, with the current government unlikely to be able to secure the required number of votes in support of candidate Dimas. As such, we continue to expect a snap election to have to be organised for as early as end-January, with polls suggesting a Syriza-led coalition government likely to take power. This may prompt concern about the sustainability of Greece’s EMU membership, given Syriza’s radical political stance, and place further downward pressure on EURUSD," Barclays explains. Finally, Barclays technical strategists note that recent depreciation through range-low support opens up targets around 1.21 and 1.2040. The main event of the final two weeks of 2014 may prove to be Greece’s presidential election, notes RBS. "The coalition’s candidate, Stavros Dimas, will have two more attempts to win Greece’s presidency, on December 23rd and 29th. In a first attempt, Dimas garnered just 160 affirmative votes among the 300 MPs, well below the 200 votes needed in that round," RBS explains. "The second round also requires a likely insurmountable 200 vote threshold, meaning focus lies on the December 29th third round. A failure to win the presidency at that round would result in an early general election next year where all 300 seats in Greece’s parliament would be up for election," RBS adds. "With anti-bailout party SYRIZA currently leading in the polls, new elections could add headline risks to an already fundamentally negative mix for the EUR," RBS argues. Euro weakness has accelerated overnight after EUR/USD broke below key support at the 1.2000-level after which it declined sharply to an intra-day low 1.1864 reaching its’ lowest level since March 2006, notes Bank of Tokyo-Mitsubishi (BTMU). "It is a strong technical signal that the euro is likely to weaken further in 2015 moving deeper into undervalued territory. Over the last decade EUR/USD has tended to bottom at around the 1.2000-level,which on this occasion appears less likely," BYMU argues. "The next key support level for the pair is provided by the low from November 2005 at 1.1640, after which a break below could open the door for a move towards the 1.1000-level later in 2015," BTMU projects. On the macro front, BTMU notes that the move lower in EUR/USD has been reinforced by building investor expectations that the ECB will soon adopt more aggressive monetary easing perhaps as soon as at their next meeting on the 22nd January. Along with that, BTMU also notes the euro has also been undermined by speculation that Germany is now ready to see Greece quit the euro-zone if the populist Syriza party wins this month’s snap general election and reneges on the country’s reform programme. "In these circumstances, it is likely that the euro will remain under downward pressure in the near-term.The seasonal bias is also in favour of a lower euro. The euro has underperformed against the US dollar , on average over the last twenty years, during the first six weeks of the calendar year which appears likelyto be repeated this year," BTMU projects.